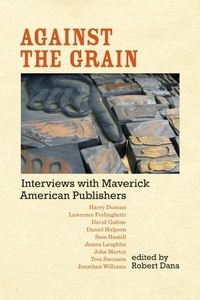 "Against the Grain" is a collection of interviews with nine small press publishers, each one characterized by strength of resolve and a dedication to good books. Each press reflects, perhaps more directly than any large trade publisher could, the character of its founder; and each has earned its own place in the select group of important small presses in America. This collection is the first of its kind to explore with the publishers themselves the historical, aesthetic, practical, and personal impulses behind literary publishing. The publishers included are Harry Duncan (the Cummington Press), Lawrence Ferlinghetti (City Lights), David Godine (David R. Godine), Daniel Halpern (the Ecco Press), Sam Hamill and Tree Swenson (Copper Canyon Press), James Laughlin (New Directions), John Martin (Black Sparrow), and Jonathan Williams (the Jargon Society). Their passion for books, their belief in their individual visions of what publishing is or could be, their inspired mulishness crackle on the page.